Flooding along Park Ave during a severe rainstorm in Bridgeport, Conn., on Tuesday Sept. 25, 2018. Dozens of cars were left stranded in flooded streets around the city and there have been reports of boat rescues from homes inundated by storm water as well. FAIRFIELD — Eliminating flooding along the Rooster River won’t be a simple job, but it has begun. Residents who attended a meeting in town Thursday night were given the latest update and given an assurance: the flooding that happened on Sept. 25, 2018, should never happen again. That day, a storm hit the area hard, dropping about 7 inches of rain on Fairfield and Bridgeport, causing flooding to homes on both sides of the Rooster River. 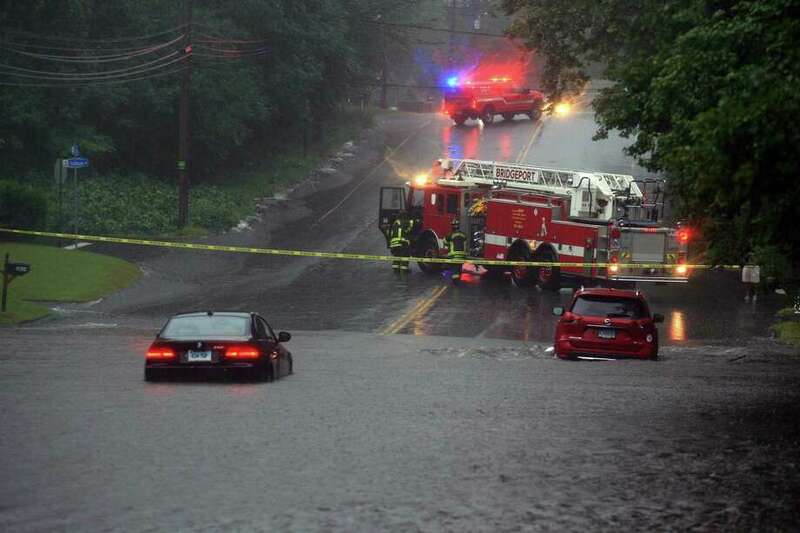 First Selectman Michael Tetreau said in a phone interview Thursday that after the storm, police, fire and health department personnel went out to affected areas. He said he went out to check on the damage the weekend after the storm. What the town has discovered, Tetreau said, was that there was no immediate, single thing to be done to fix future potential flooding. During September’s storm, several backyards were covered in water and various basements were flooded up to the first floor. “Even though FEMA didn’t recognize it as a disaster area, it was just as damaging as one to the residents,” Tetreau said. As a start, the town will be running cameras down the water pipes in town to ensure there’s nothing blocking water from getting through. The town has been working with Bridgeport and Trumbull to coordinate whatever efforts are necessary to fix problems, including asking for state funds for some of the projects. “We’re working together so we don’t do something that causes a problem for somebody else,” Tetreau said, adding that some problems that could be fixed in Fairfield could make things worse in Bridgeport. “We’re trying to work together to make sure that everybody understands,” he said. In late December, officials from Fairfield, Bridgeport and Trumbull met to announce a cleanup of the Rooster River, which runs through all three. Tetreau said the cleanup effort launched that day, is complete. Now the representatives are looking at above-ground water retention. “This is brilliant because it’s something we don’t have to turn on and off,” Tetreau said. The above-ground water retention system would be very low-tech, he said, and would mimic something similar to what was done in downtown Fairfield on the Sherman Town Green. “We just finished a big pit under there so that we can drain water from the Post Road into that pit and have it retained there,” Tetreau said. He said the pit helps prevent major flooding in downtown, which is one of the lowest-lying points in Fairfield. But no hopeful project can get under way without funding, something the repair group is still looking to establish.